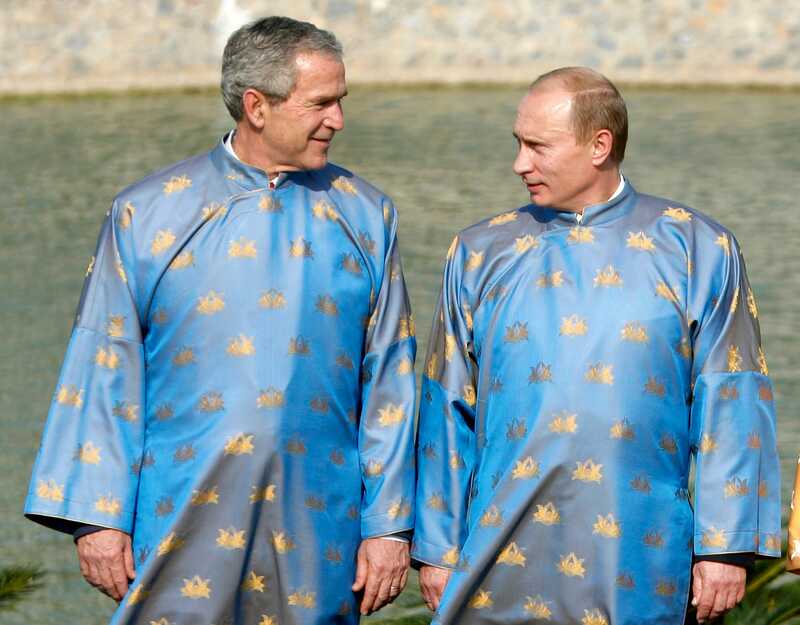 The ao dai is the Vietnamese traditional costume, commonly worn by women but also worn by men (George W Bush and Vladimir Putin wearing the ao dai can be seen here). Today western clothes are prevalent, so a girl gracefully riding a bicycle in an ao dai is a rare sight, specially in Ho Chi Minh City where motorcycles dominate the road. But the ao dai remains the standard costume for weddings and big events like Tet holiday celebrations. Incidentally, celebrations for the Vietnamese New Year (Tet holiday) start this week. It’s the most important festival in Vietnam. May all your wishes come true! Vạn sự như ý! Beautiful and feminine, culture makes us who we. A lovely shot of a graceful girl, well done 🙂 . I like your fashion shot of the models too. Lovely girl and dress, but my oh my, what a photo of Bush and Putin. Is it real? Yes, that photo of Bush and Putin was taken when Vietnam hosted the APEC meeting in 2006.